The SafeBolt Mail user interface is a browser-based utility that allows you to manage not only your email but the many collaborative tools available for your use. To login to the SafeBolt Mail webmail interface, go to mail.safebolt.com and login with your full email address and password. 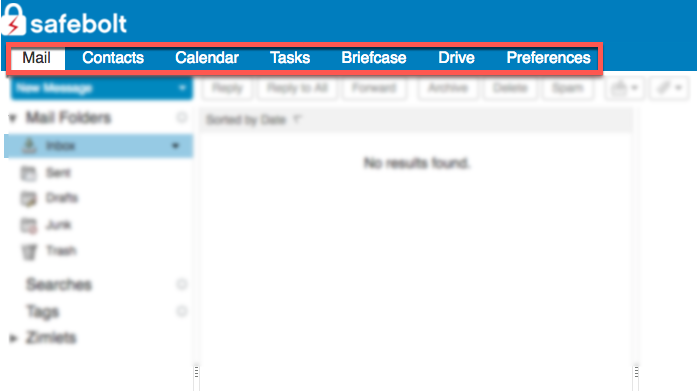 The application tabs near the top of your screen indicate what areas of SafeBolt Mail you will be working with. Please note that only customers who have purchased Premium Hosted Email will see and be able to utilize all the application tabs. If you find that one of these application tabs is missing and would like to have it available, consider upgrading to a higher level of service! For more information, please contact our sales team.